Feed your adrenaline and step into a breathtaking world where glaciers rest above and birds soar below. Iconic new Canadian Rockies are now open to the world. Experience waterfalls, wildlife, fossils and more on an exciting cliff-edge walkway that leads to a platform where glass is all that separates you from a 918 foot drop. From ice-capped mountain peaks to vast glacier-formed valleys, the Glacier Skywalk is your front row seat to nature’s most grand performance. Take your time to journey along the Discovery Trail; a fully-accessible, cliff-edge walkway. Look down and you’ll see hints from life thousands of years ago. Look up and you’ll see the most stunning mountain and glacial vistas. Look around and you’ll discover one of the most unique ecosystems in the world – a place that’s so hard to survive that adaptation never ends. 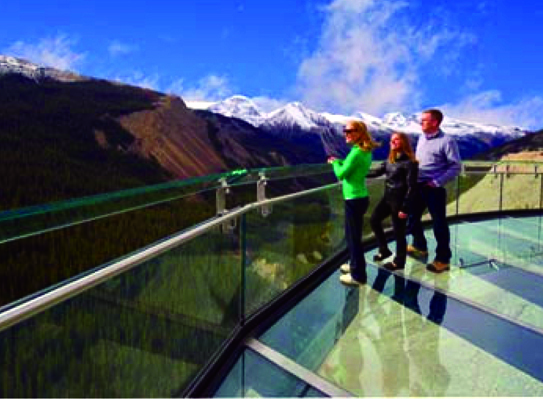 The grand finale to this experience is an exhilarating glass-floored observation platform 280 metres (918 ft) over the Sunwapta Valley. A bird’s eye view provides the most unique perspective of nature at its finest. 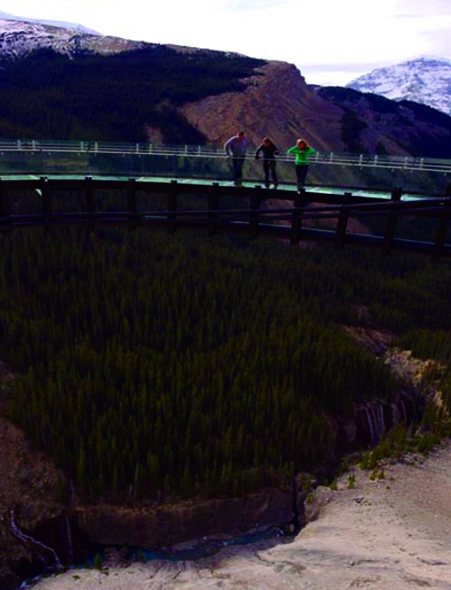 Glacier Skywalk is a fully accessible attraction that offers visitors a unique way to connect with the wilderness of Jasper National Park. A cliff-edge interpretive walkway provides an immersive and multi-sensory experience centered around the glaciology, biology and ecology of the unique Columbia Icefield region. After years of design, planning, environmental monitoring, and construction, the Glacier Skywalk is ready to welcome visitors from around the world. 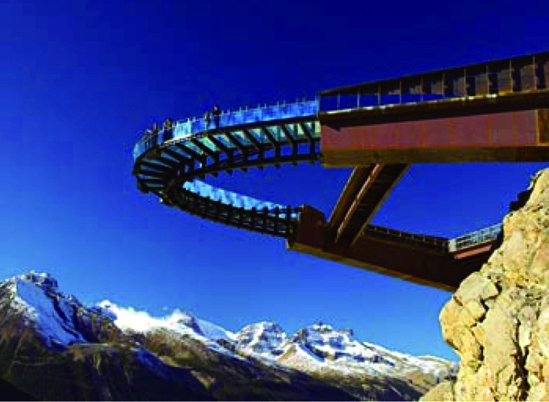 The vision behind the Glacier Skywalk was to create a world-class fully-accessible experience in Jasper National Park that engages visitors to learn about glaciology, geology, and the unique ecosystem of the Columbia Icefield area. With a series of interpretive experiences that appeal to a broad cross section of the population, park visitors will return home more aware of the global environment and Canada’s National Parks. Through their up-close and personal connection, they will be positively impacted and inspired to consider the environmental choices they make in their daily lives. The Glacier Skywalk is now open daily. Grand opening celebrations were held at the Columbia Icefield Glacier Discovery Centre on May 10-11, 2014. The glass-floored observation platform is fricken amazing! !